26M Rainbow Their Facebook Profile - Joe.My.God. 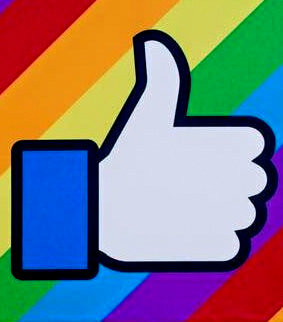 Over the past three days, 26 million people have super imposed rainbows over their Facebook profile pictures using a free tool provided by the company. The rainbow filter launched Friday and continued to gain steam over Pride weekend, garnering more than half a billion likes and comments all over the world. Famous people including Russell Simmons, California Attorney General Kamala Harris, Leonardo DiCaprio, and Arnold Schwarzenegger, and Brazil’s president Dilma Rousseff changed their profiles. The tool was created by two Facebook interns during an internal hackathon last week. Changing a profile picture is easily dismissed as low-effort activism. But for many people who are not typically political it was a way to quietly show support.